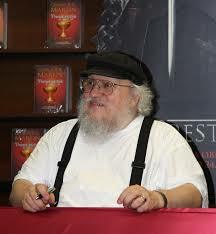 Obsessive Game of Thrones fans are truly worried about their beloved author, George RR Martin. Why? Well, he doesn’t look so great. He’s obese, he’s 65, and he wears Crocs, but what they really want to know is whether he will still be around to finish the series. Fear not, Martin had an answer for them. And one, rather stumpy looking finger. In a recent interview with Swiss daily Tages Anzieger, the question of whether he will live long enough to finish A Song Of Ice and Fire was asked. “Are you kidding me? I find that question pretty offensive, frankly, when people start speculating about my death and my health, so f**k you to those people,” the bearded grump replied.